• And many other topics of particular interest to those over 50. 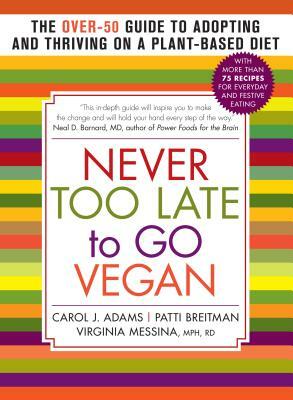 Carol J. Adams is the author of the pioneering The Sexual Politics of Meat, called a “vegan bible” by The New York Times and now in a twentieth-anniversary edition, plus more than twenty other books and over one hundred articles. She frequently speaks on college campuses. She is working on a memoir about her decade as a caregiver. She lives near Dallas, Texas, with her partner and their two rescued dog companions, Holly and Inky. Find out more about Carol at caroljadams.com. Patti Breitman is the director of the Marin Vegetarian Education Group and a cofounder of Dharma Voices for Animals. She is the coauthor, with Connie Hatch, of How to Say No Without Feeling Guilty and, with Carol J. Adams, of How to Eat Like a Vegetarian Even If You Never Want to Be One. Patti is on the advisory council of the Animals and Society Institute and grows vegetables in her community garden. She teaches seasonal vegan cooking classes in Marin County, California, where she lives. Virginia Messina, MPH, RD, is coauthor of Vegan for Life and Vegan for Her and of the first textbook on vegetarian nutrition for medical professionals. She writes and speaks on vegan nutrition for both consumers and health professionals. Ginny serves on the advisory board of the Vegetarian Resource Group and on the board of directors of VegFund. She lives in Port Townsend, Washington, with her husband and an ever-changing population of rescued cats. Find out more about Ginny at theveganrd.com.